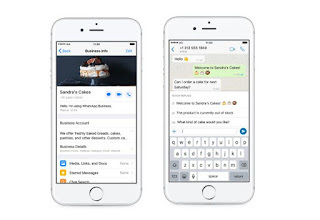 The WhatsApp business app which was launched back in September of 2017 for Android users have now started rolling out globally for iOS users also. The rollout initially began a couple of weeks ago but until now, it was only available in a few countries. WhatsApp made the announcement in an official post which was published on it's blog. Even though the App is now released globally, it will first be released in countries like Brazil, Germany, Indonesia, India, Mexico, United Kingdom and the United States, before being extended to other countries in the world. WhatsApp didn't just announce the iPhone version of the business app, but the company also launched the web version which will make the chat accessible on desktop also. Unlike your regular WhatsApp application, the business App gives you a lot more features and benefits like automated quick replies, greeting and away messages which is similar to that of Facebook Messenger. when setting up your account, you also get to create a profile with the establishment’s address, working hours and links to social media accounts.